As soon as things slow down it’s like an instant, full-blown reminder of the dog that is missing in my life. This time the feeling first manifested itself as a serious longing to have Zabora back. I was missing her tail wags, cuddling, and genuine pitty smile. It seems I need to find another furry soul to take in, nurture and love, then pass off to a deserving family. It’s tough though, after a long dog hiatus, to make the decision to jump back in. It’s not easy to re-adjust your life to accommodate another living creature again. No one can deny that a dog-less life means more freedom and less responsibility. You stop worrying about your pooch at home and you are free to do what you want when you want. When it comes time to change that again, it really is hard! I have friends that live in another city that I like to spend weekends with, I visit my boyfriend when I can, sometimes I have to work late… all of these things will need to be adjusted if I want to bring home another foster. I’m okay with it because it’s always worth it, it can just be a harsh realization – a realization that many people don’t understand when they get a pet, which is one reason for the abundance of homeless animals. So now it’s time to make the decision: do I bring home another foster? Aleksandra is officially gone to the other side of the country (heartbreak of the century), so this one will be completely mine: no swapping when I need a free weekend, no constant marketing on a multi-thousand hit blog. It’s a huge responsibility to get a dog adopted, and that is a reality you have to face when you sign up to foster. Am I willing to make the commitment, especially with the holidays looming so close? I started this blog so I could share my journey – both the positive, inspiring parts of fostering, as well as the difficult parts. So stay tuned as I decide where to go from here. Sorry for the horrific iPhone photo quality. 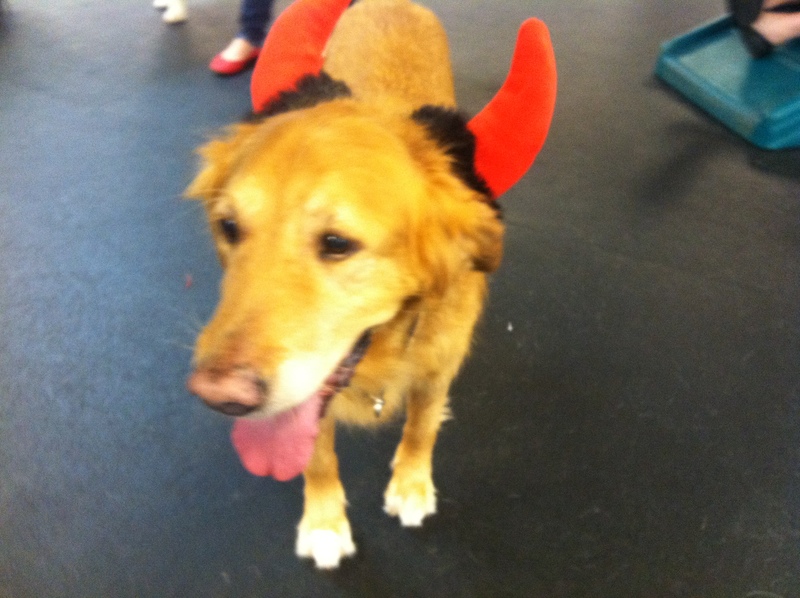 Get excited for more pictures from Friday’s Howl-o-ween party. This entry was posted in Dog talk, Rescue/Humane Society and tagged adoption, foster, halloween, holidays, humane society, pit bull, rescue. Bookmark the permalink.